With a plethora of characters, none of whom is discernibly good or evil, le Carré’s novel is admittedly difficult to follow. Add a dozen or more code names to this roster, as well as the many temporal shifts of the novel, and Tinker Tailor becomes quite a doozy to decode. 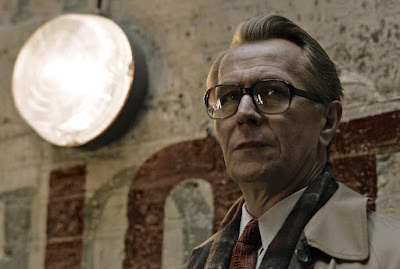 That’s part of the fun, though, as the espionage game, in which George Smiley (Gary Oldman) comes out of retirement to ferret out a mole in the British intelligence agency The Circus, is an involving puzzler; however, the film version is considerably easier to piece together, for viewers have the added convenience of associating a name with a familiar face. The mystery becomes Smiley’s assignment when the leader of The Circus, Control (John Hurt), dies shortly after being ousted from the agency. Smiley got the sack along with Control, being his right-hand man, so the fallen agency must reconcile matters when talk of a mole resurfaces shortly after his superior’s death. Control had suspected one of his own of conspiring with their Russian counterpart Karla (an unseen force in the film). The Karla mystery comes back when one of The Circus’s own men, Ricki Tarr (Tom Hardy), is suspected of defecting but then returns with an alleged informant. Much of this plot development actually occurs an hour or so into the film’s running time, yet the non-linear chronology of the script is not nearly as confusing as it sounds. The script by O’Connor and Straughn is really quite lucid, despite its fragmented nature. The switches in tense are well signalled, as are the identities of key players and their essential traits. Tinker Tailor is as dense as its source; however, the fine performances of the ensemble, as well as Alfredson’s precise direction, deliver the clues with utmost clarity. Central to the brilliant tinkering of Tinker Tailor is Oldman’s tour-de-force performance as Agent Smiley. 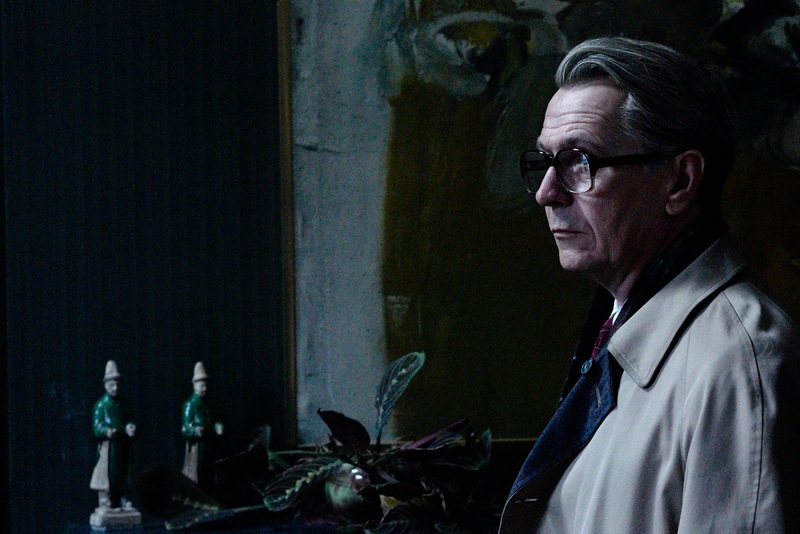 Oldman’s calm, observant demeanour offers a classically tailored incarnation of the British spy – like an old, weathered James Bond, but without the kitsch. In spite of Oldman’s commanding lead, he eclipses none of his co-stars. 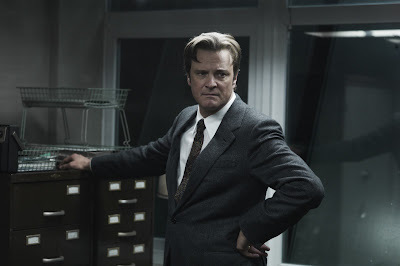 The ensemble brings out the best in le Carré’s meaty characters, from Colin Firth’s suave Bill Haydon (code-named Tailor in Control’s mole-hunt) to Toby Jones as the impish Scotsman Percy Alleline, who ousts Control in a form of coup d’état, without knowing that he himself is one of the grandmaster’s suspects (code-named Tinker). Standing out among the supporting players, however, is Benedict Cumberbatch (Atonement, War Horse) as Smiley’s wingman Peter Guillam. He and Oldman share some especially fine scenes. All of the cast members are excellent, though, from Oldman’s lead to a cameo by Kathy Burke. As Alfredson draws out the best from his actors, so too do his arts and tech collaborators excel. The Cold War grudges that situate the novel – both its plot and its initial printing – are transformed into rich details for a 1970s-set period piece. The old-fashioned feel of Tinker Tailor befits le Carré’s prose, and the adaptation smartly opts not to rework itself for contemporary politics or locations (as some others do with varying degrees of success). Instead, Alfredson unfurls the ruse amidst old cars and retro-suits (well-tailored by Jacqueline Durran). The cinematography by Hoyte Van Hoytema lends the film a cool steeliness, while composer Alberto Iglesias adds a fine air of suspense and intrigue. Finally, editor Dino Jonsäter should be commended for piecing the film together, making Smiley’s game consistently baffling yet always perceptible. This is a solid, flawlessly produced film in the vein of potent films like The Lives of Others or North by Northwest. 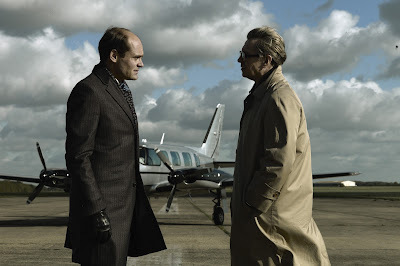 Tinker Tailor Solider Spy is an excellent spy thriller. Although a thoroughly talky film, it offers the pace and pulse of other espionage tales, but it has brains to boot. Most exciting, though, is Oldman’s unassailable realization of George Smiley: watching Smiley sweep a room with his well-trained spy’s eyes adds an element of suspense not on offer in the basic game. 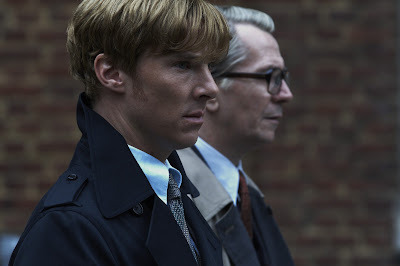 Oldman is one sly cat in Tinker Tailor and the film is a worthy triumph. *Note: Tinker Tailor Soldier Spy made my list of the Top Ten films of 2011; however, I did not have time to see it before making my list of the the year's best performances. Tinker Sailor Soldier Spy is currently playing at the Varsity and AMC in Toronto. It opens in Ottawa January 20th.